Are the poor truly responsible for their own wretchedness and misfortune? Are their tragedies completely their own making? These are just two of the main questions that J. B. Priestley’s An Inspector Calls puts to its audience by way of a biting critique of contemporary society, pitting the opposite poles of capitalism and socialism on a collision course. The play was penned in 1945 and originally staged in the USSR before eventually being performed in Britain the following year. It largely fell out of fashion for several decades before it was revived in the early 90s and again this decade in a production by Stephen Daldry – winning a series of awards along the way. I was fortunate to catch the London production a few years ago and was glad to catch MADC’s production last weekend at the Blue Box Theatre in Msida, which did the script splendid justice. Set in 1912, Priestley presents us with the Birling family, a comfortably bourgeois family set in England’s industrial north who are celebrating their daughter Sheila’s engagement to Gerald Croft, son of their commercial competitors. Their evening is interrupted when a visitor, presenting himself as Inspector Goole, shows up at their door and proceeds to quiz each of them in turn in connection with the suicide of Eva Smith. Each of them deny the slightest connection with the victim, until the inspector gradually shows how they have each contributed to a chain of events that led to Smith’s desperate suicide. The plot goes further than being a mere whodunnit but presents a couple of further twists that go back to questioning the very premise of the suicide itself – with the result that the audience is kept on the edge of its seat for the full length of the play. The production was a solid one that worked in practically every aspect under the direction of Michael Mangion. The casting was particularly spot on and each of the actors’ performances was thoroughly enjoyable – though if I had to single out one performance among them all, then that would have to be Roberta Cefai’s; she played the role of Sheila Birling convincingly and earnestly. Sheila is perhaps the one family member who genuinely feels contrite after realising the horrid selfishness and cruelty with which she and her family have acted towards someone who was obviously far more vulnerable. Cefai delivered an honest and believable performance that didn’t miss a beat. Sheila’s role is contrasted with that of her mother, Sybil – played by Isabel Warrington – who remains somewhat hardened and cynical to the end. Warrington’s performance too was delivered with wonderful attention to detail, down to the slightest twitches of her nose as she bristled on hearing Inspector Goole’s accusations gush forth. The title role of Inspector Goole was played by veteran actor John Marinelli, who delivered a finely balanced performance that alternated between deadpan cynicism and sardonic scorn as he toyed with each of the Birling family members, prodding them to confess their sins of privilege, almost with a sense of schadenfreude. 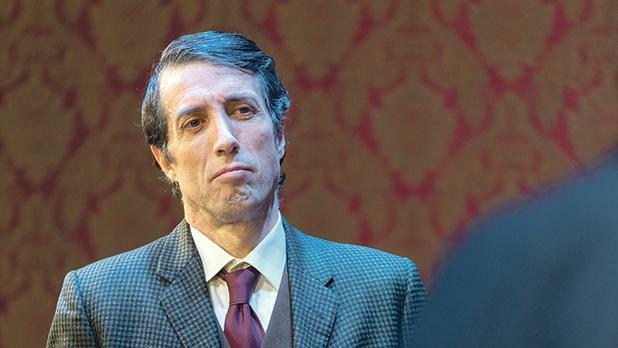 There are few actors on the Maltese stage who can deliver lines with the clarity and diction of Marinelli, and this performance was no exception. The other performers, Edward Thorpe (Arthur Birling), Gianni Selvaggi (Gerald Croft) and Edward Caruana Galizia (Eric Birling) all did exquisite justice to the roles carved out for them by Priestley’s script and played terribly well against each other. The revival of the play in the 1990s and earlier this century depended heavily on intricate staging and extensive construction of a multi-storeyed Birling house, which comes crashing down heavily at the end of the show. No doubt constrained by their more modest budget, the MADC kept this production in line with the original staging of the play – a static Edwardian drawing room. The production was in no way hamstrung by this decision and the simple set worked effectively in its simplicity. The only misgiving I had concerned the final twist added by the director, who chose to end the play with a brief projection showing some of the horrors of war and poverty of the last century. This jarred with the otherwise straightforward direction that the play had taken up to that point and was somewhat unnecessary. While appreciating that the energy of the play builds to such a point that it needs to go out with a final bang, the film reel gave a somewhat hackneyed perspective to it all. This was one of the better productions I have seen by the MADC in recent years. Although the play runs the risk of coming across as a dated, Edwardian drawing-room-armchair drama, the production successfully steered clear of this and was at once both relevant and enjoyable. An Inspector Calls is produced by the MADC and runs at the Blue Box Theatre in Msida until today.